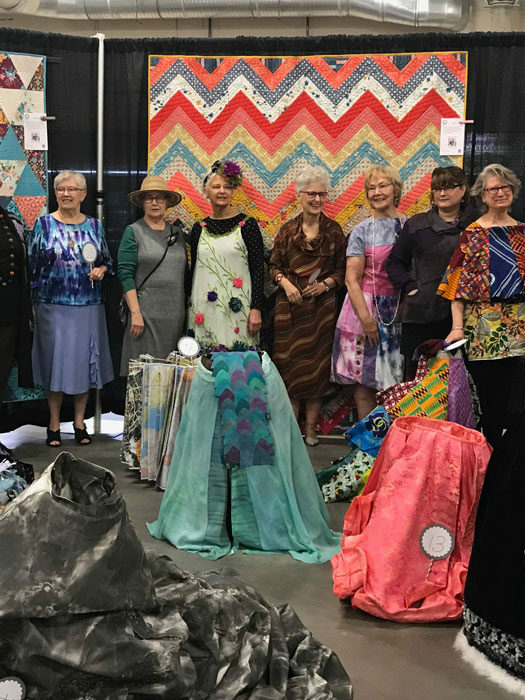 Last week I had the pleasure once again of judging the Clark County Quilters Show in Ridgefield, Washington. My fellow judges were Val Pellens and Gerrie Thompson. 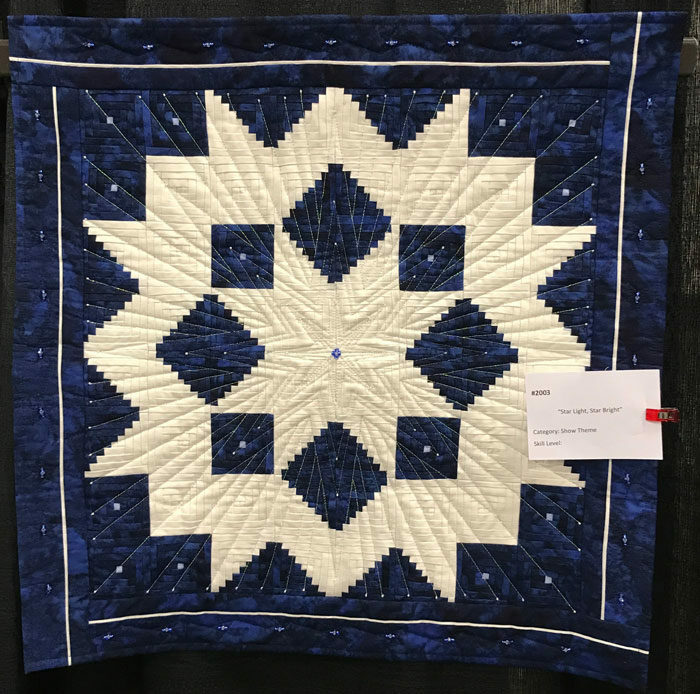 As usual, the caliber of quilts were high which made judging so enjoyable. 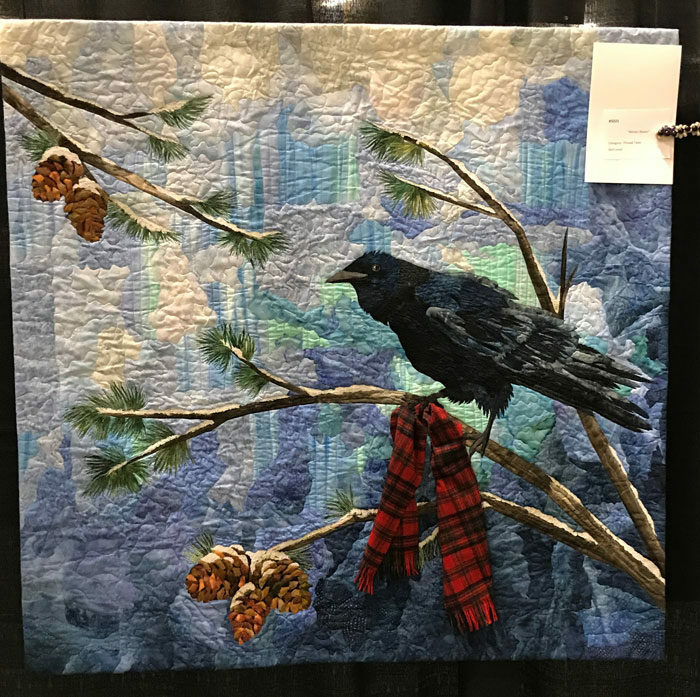 This show has best of show for large and small/wall quilts which is great, because it’s challenging for smaller quilts to compete against bed-size. 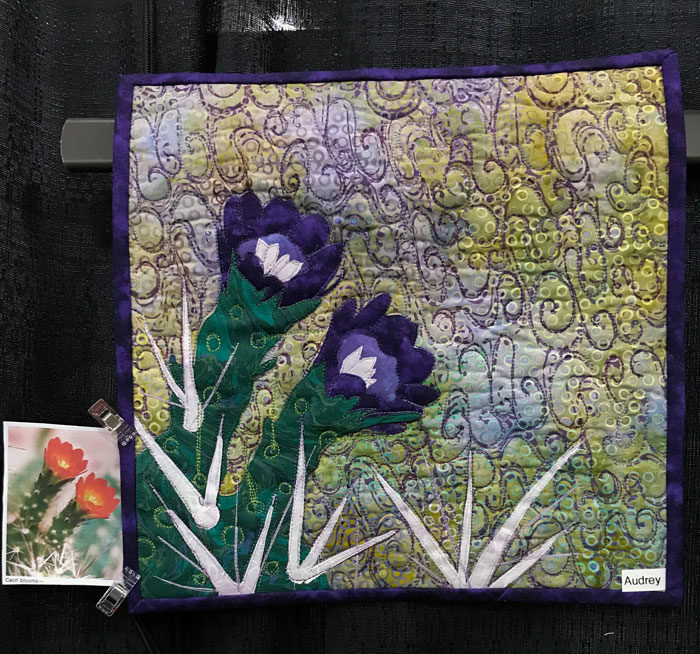 Our best of show large, “Dinner Plate Dahlia” by Carol Hattan and quilted by Cathie Boucher-Sollman, is one of the popular Quiltworx patterns. Best of show wall was “Who’s on First, Vaughn Street, Portland, Oregon” by Judith Phelps. This is such a great quilt on so many levels. Note the way Judith has used neutrals alone and achieved such a range of values. It’s a wonderful composition with strong vertical lines. The techniques are a combination of appliqué and surface design. But what I admire most is the story telling. The viewer wonders what is so fascinating to the children. This artwork is based on a vintage photo. The kids are sneaking peeks at a baseball game. 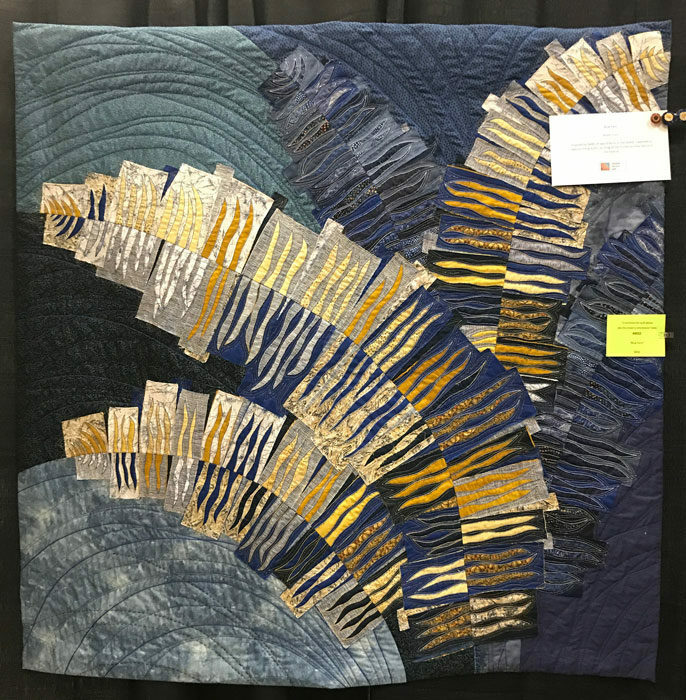 I also awarded Judith’s quilt the National Association of Certified Quilt Judges’ Merit award. I usually reserve the award for a quilt which didn’t receive an award but which I feel deserves one for some aspect. But I was compelled to honor Judith’s quilt. Judith Phelps is a member of a group called Story Tellers. 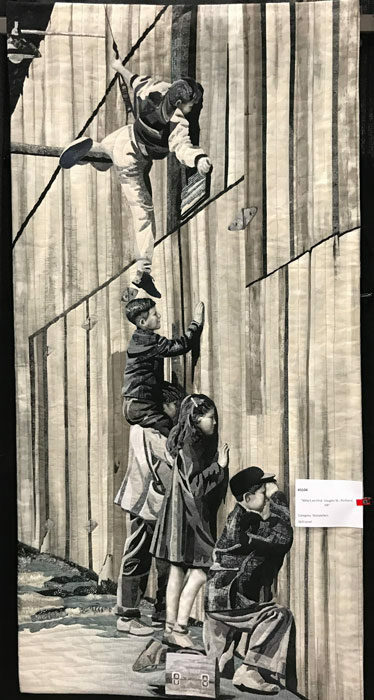 They had a separate exhibit of work based on the theme “Cities.” Judith took first place in this category for another artwork based on a vintage photo. She clearly has a great resource for inspiration. Much to my surprise the other three awards in Story Tellers was by one maker, Carol Anne Olson. Her execution is outstanding and her subject matter creative. 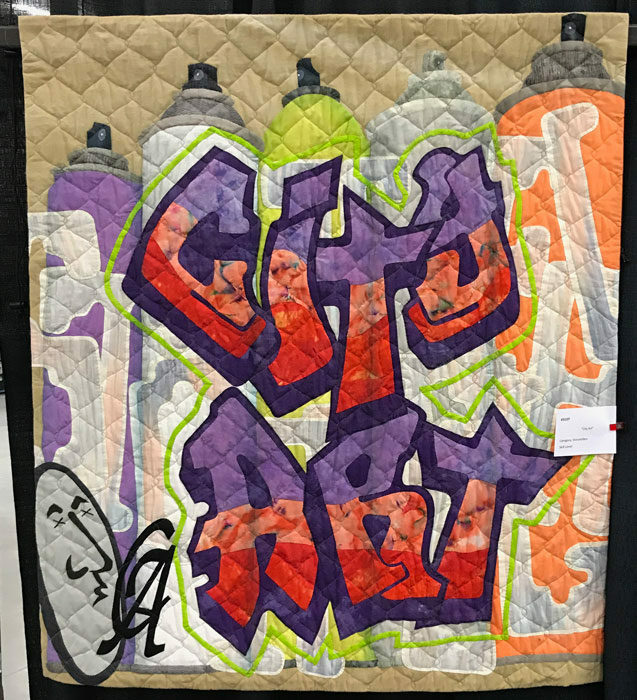 “City Art” below earned second place. I love the spray paint cans in the background and how Carol Anne carried her graffiti theme all the way through to her graffiti signature in the lower left-hand corner. Third place was “Street Life”, a Lobelia growing in concrete. 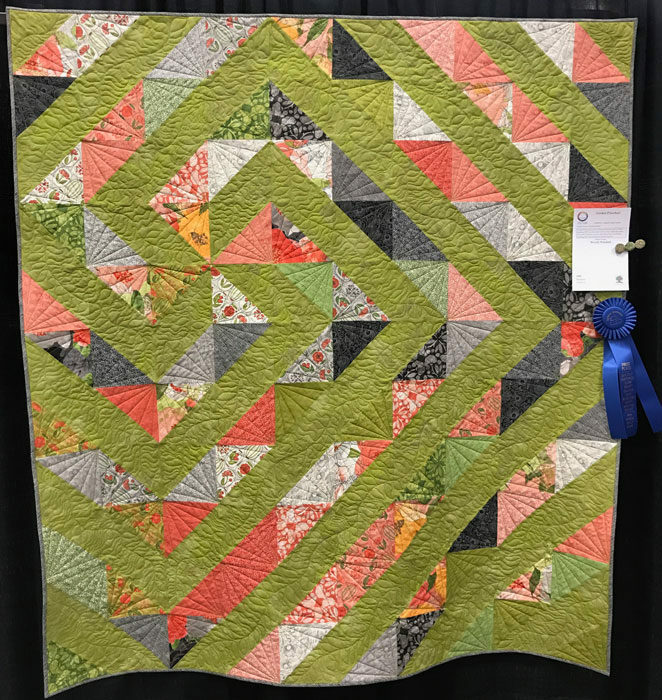 In the Modern category Beverly Woodard took first with her quilt which used yellow-green as a “neutral”. There is a best Traditional Category. I didn’t capture the maker or title. 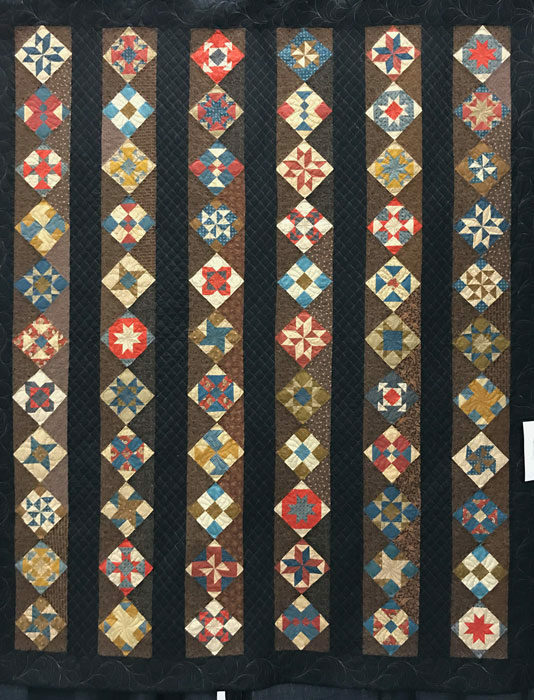 This quilt features Civil War reproduction fabrics. There is also best Non-Traditional. The winner came from the Show Theme category which was Blues and Lights. 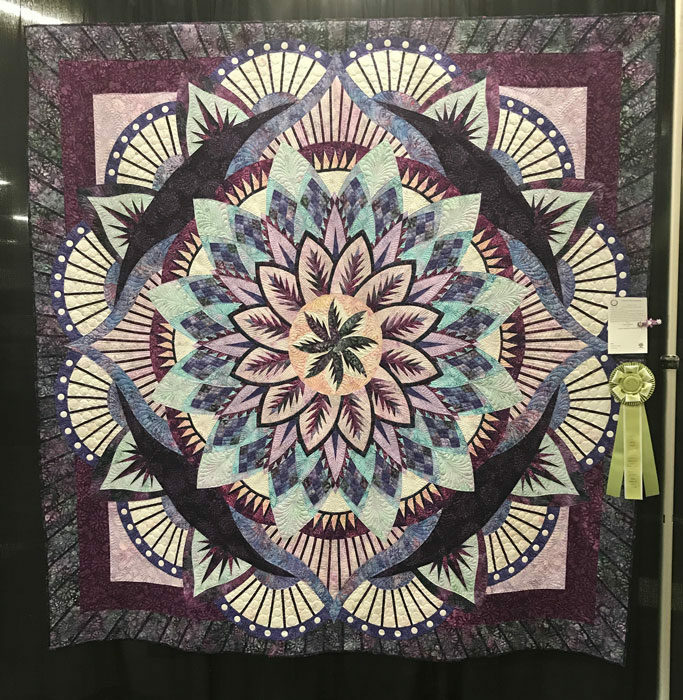 All three judges agreed the maker had achieved a creative combination of traditional–quilted wreath–with the paisley motif, arising from the border fabric. Again, no name or title. I took some photos after judging was completed. When I returned to the show on Saturday, I forgot to go back and see the makers and titles on some quilts. 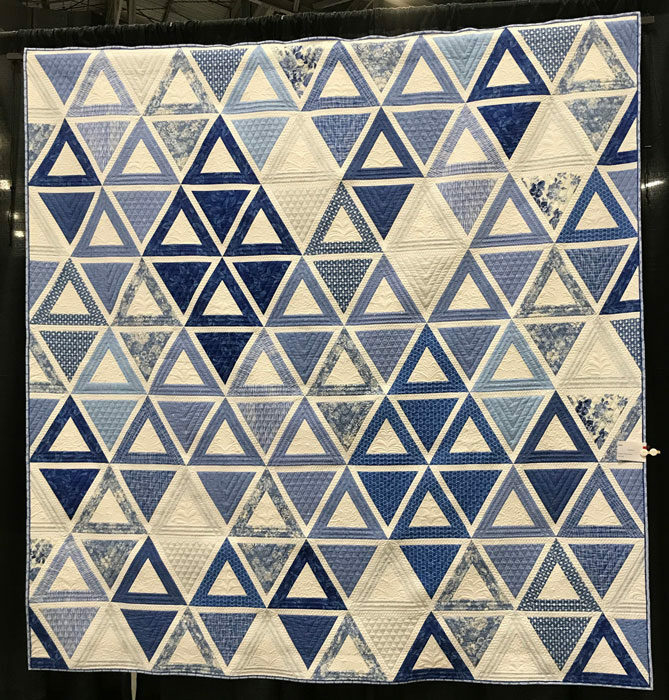 Here are two more blue and light quilts that caught our judges’ eyes. The one below captured second place in the category. This is one of the two miniatures entered in the category. 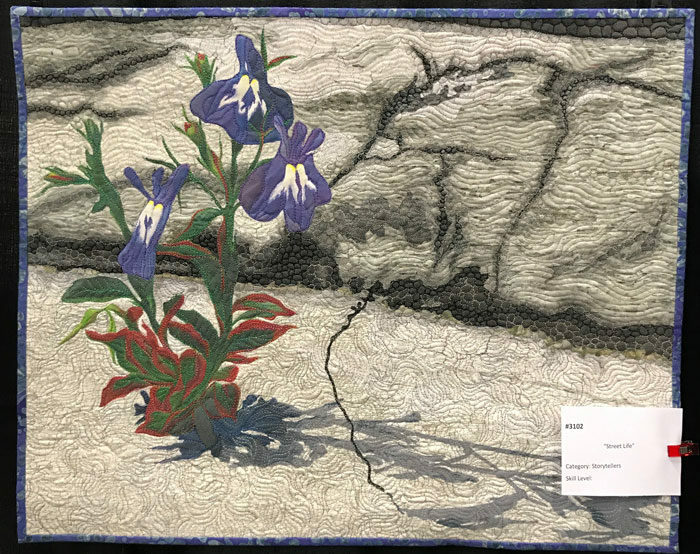 Art-Representational was this beautiful original design by Jojo Hall, which also won a machine quilting award. 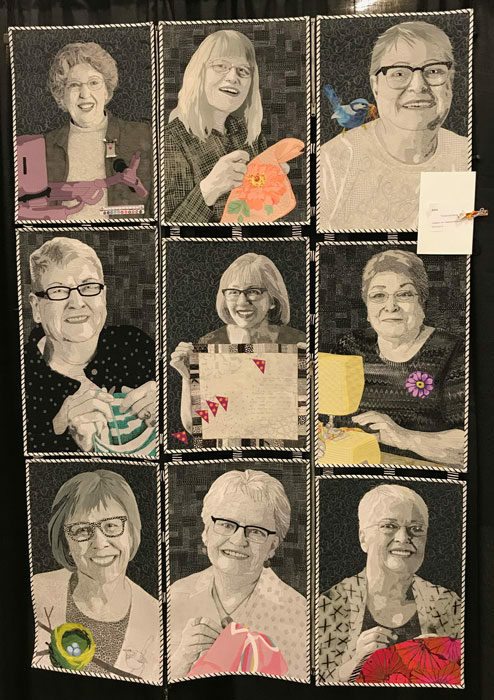 This fabulous group of portraits of nine members of Clark County Quilters was done by Lynn Czaban, known for her people and animal portraits, achieved through meticulous use of value. Note how she joined the block with zippers and tabs. A first place winner. 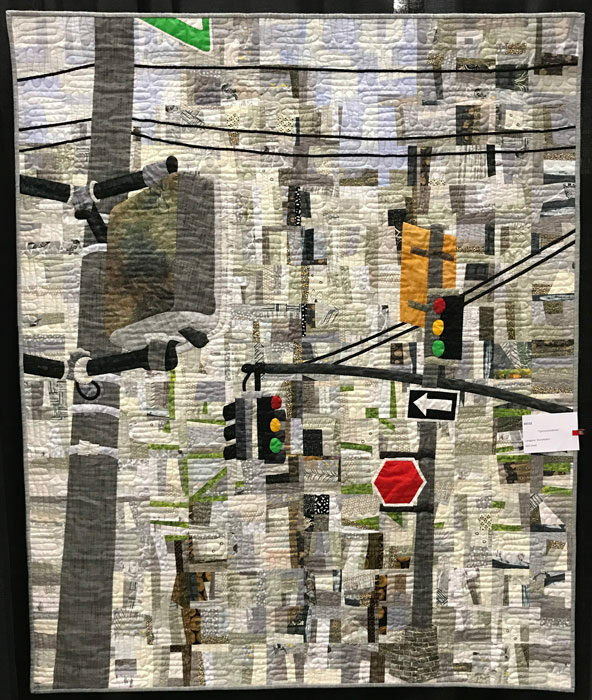 Another wonderful quilt by Judith Phelps. This next quilt was a winner in Pieced Wall. 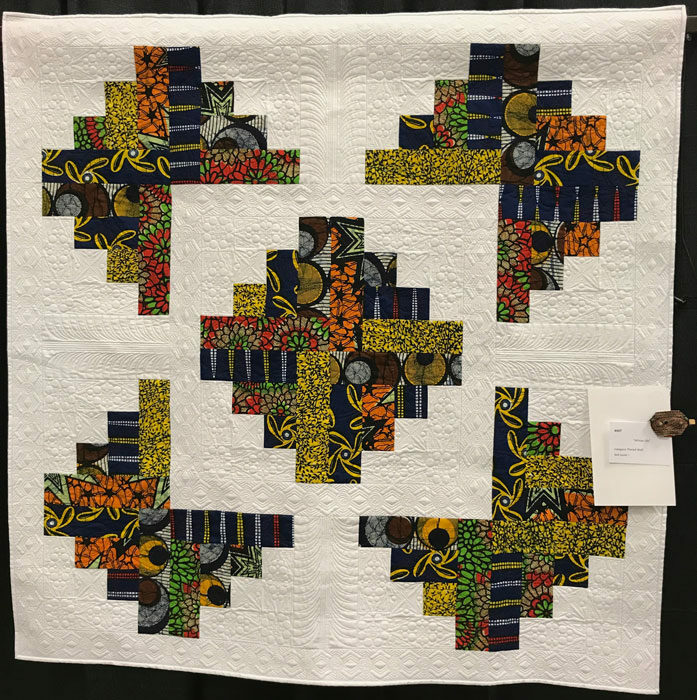 Note the great repeated quilting designs, not to mention high level of execution, which won the quilt a machine quilting award. Each judge had a judge’s choice which allowed us to select a quilt for whatever reason we liked. 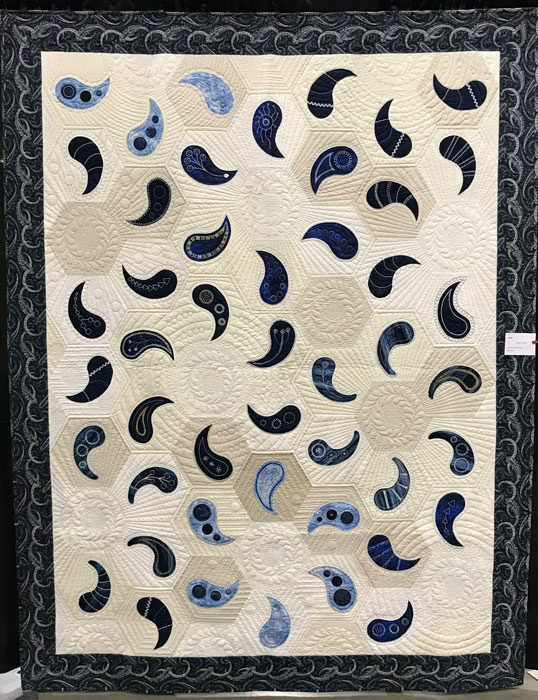 I always try to pick a quilt that hasn’t received an award but which is strong nevertheless. In this case, I found the color succession in this quilt well-done. 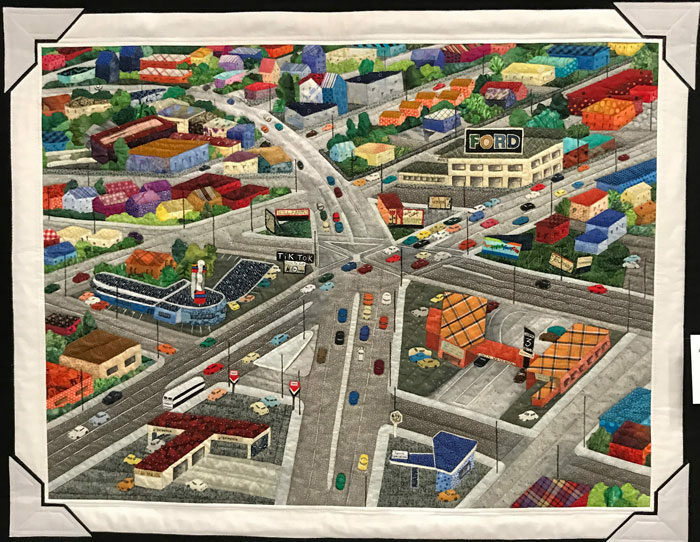 The quilting provides good texture and has a good use of repetition in conjunction with the piecing which in itself features a variety of blocks. 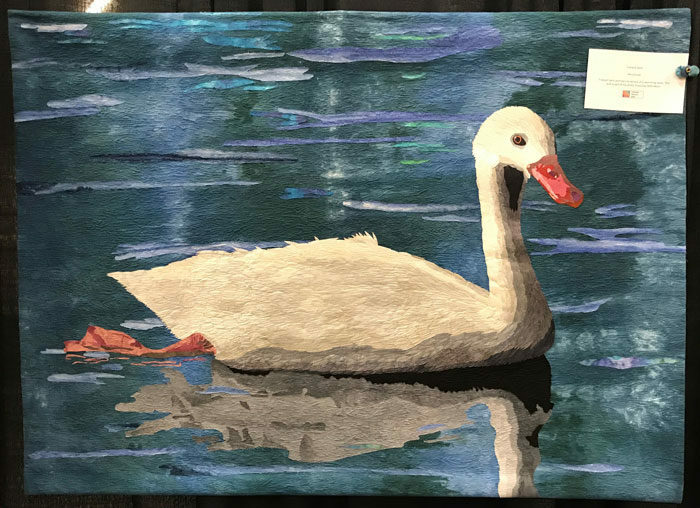 A group of Clark County Quilters did a “whisper challenge” in which the first quilter in the group creates a quilt based on a photo. But rather than pass on the photo, each subsequent quilter only receives the quilt in front of them. The results become more interesting with each quilt. This was my favorite. This first image shows a photo of a cactus and an accurate rendition of the photo. 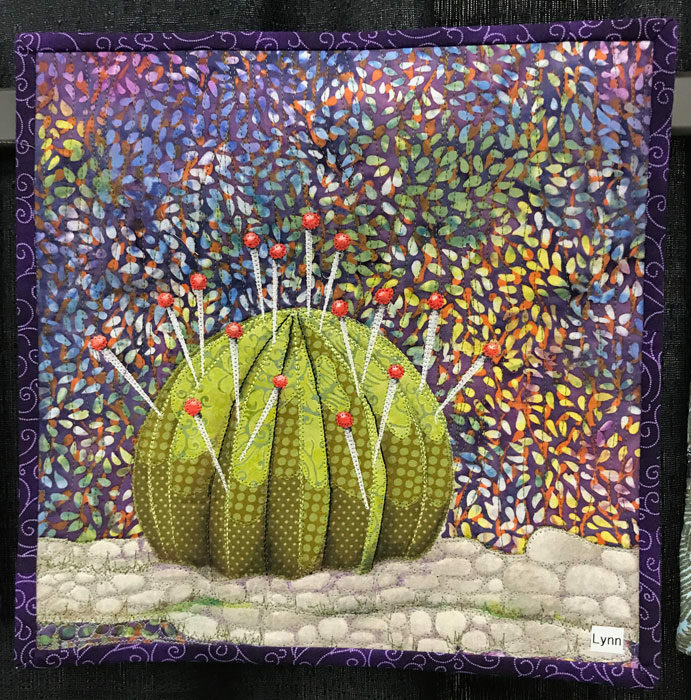 Below that is a clever “pincushion” cactus. 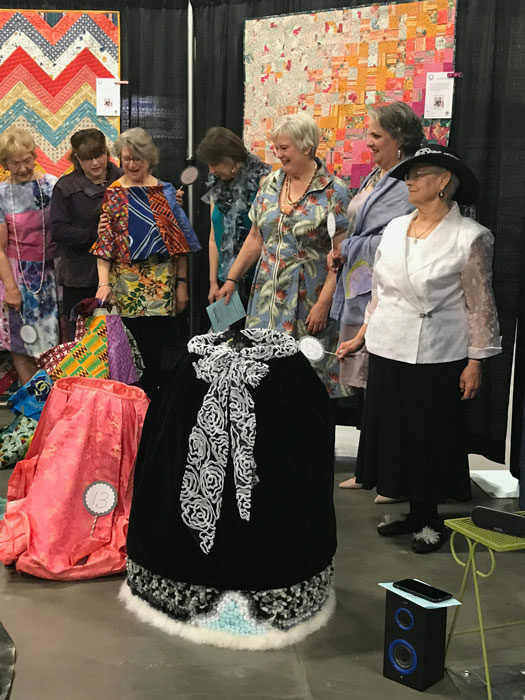 Last but not least among the wonderful variety of exhibitions and events was a show by the Columbia FiberArts Guild, of which I’m a member and a wearables fashion show on Saturday morning. 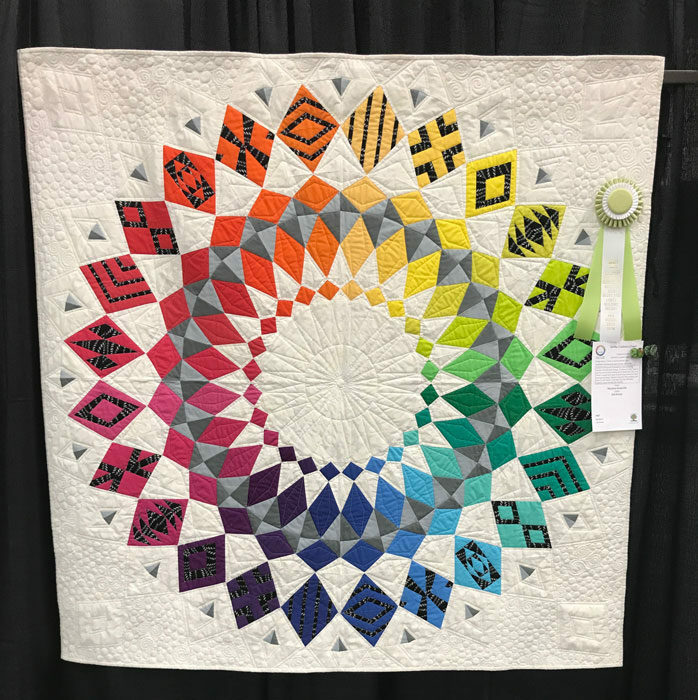 For my part, I exhibited my “Z is For Zinnia, C is For Cosmos” quilt. Here are my other two favorites from fellow members. The fashion show was a huge hit, so much so, our wearables group may be invited back next year. The fashions were a variety of wearables and fantasy. One of the highlights were the sculptural skirts members wore then took off to stand as an art installation.